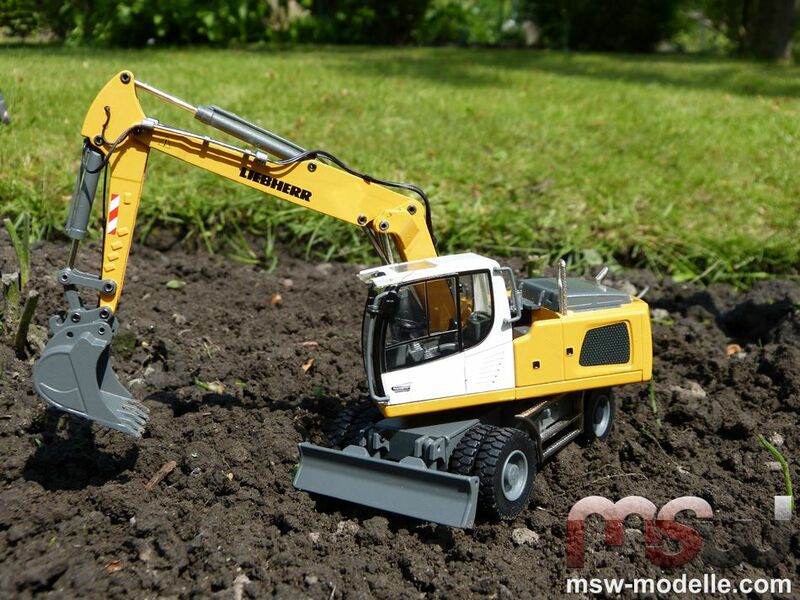 At Bauma 2013 Conrad presented – beside many other new models – two new Liebherr die-cast models, the compact AT-crane LTC1045-3.1 and the mobile excavator A920. While the functionality of both models is excellent, Conrad also realized a superior level of details. Both models will set new standards for Conrad models. 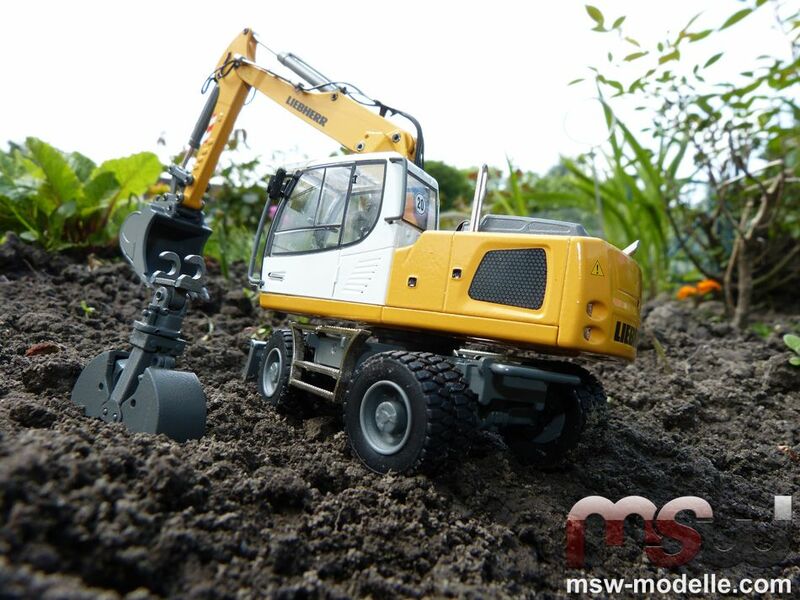 It is for sure that Conrad also followed its philosophy to create robust and massive die-cast models. The LTC1045-3.1 is a massive die-cast model made by Conrad; the level of details is amazingly superior with the typical Conrad functionality. 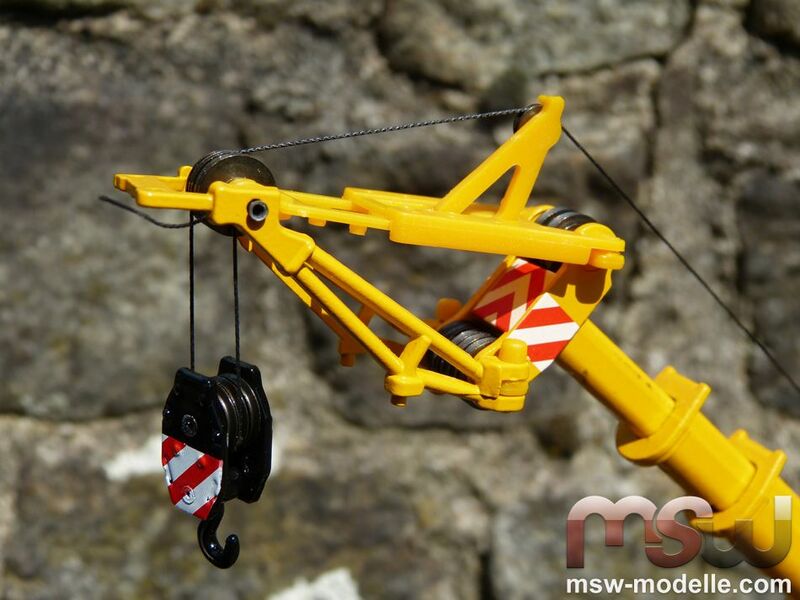 All dimensions of the real crane have been copied correctly, as for e.g. outrigger base or boom length. The 3-axle undercarriage moves easily on any surface; the steering angle is perfect. All rims look authentic and feature the same design as the real one. 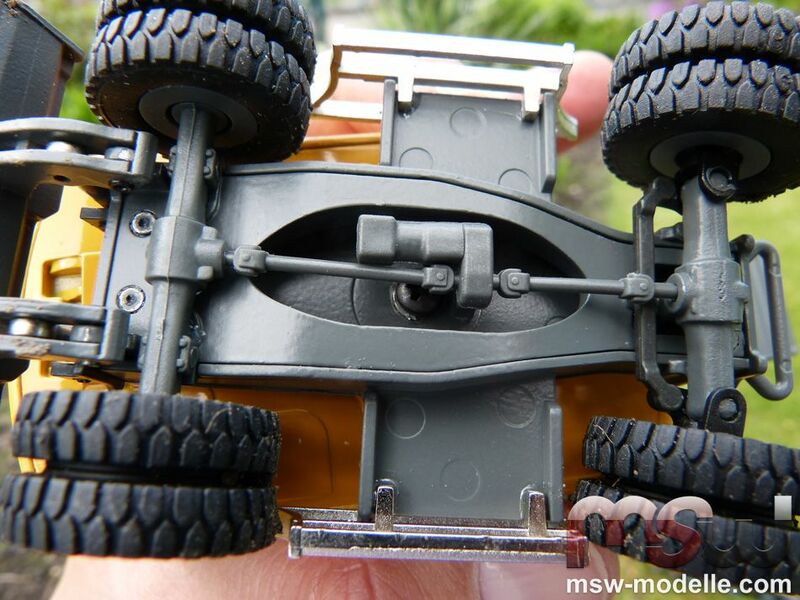 The second axle is also oscillating for a better traction. The LTC 1045-3.1 is also one of the first Conrad models with a copied drivetrain underneath the undercarriage. Ultimately all outriggers are made of zinc; plastic doesn’t exist here. Conrad also found a perfect way for the outrigger cylinders. 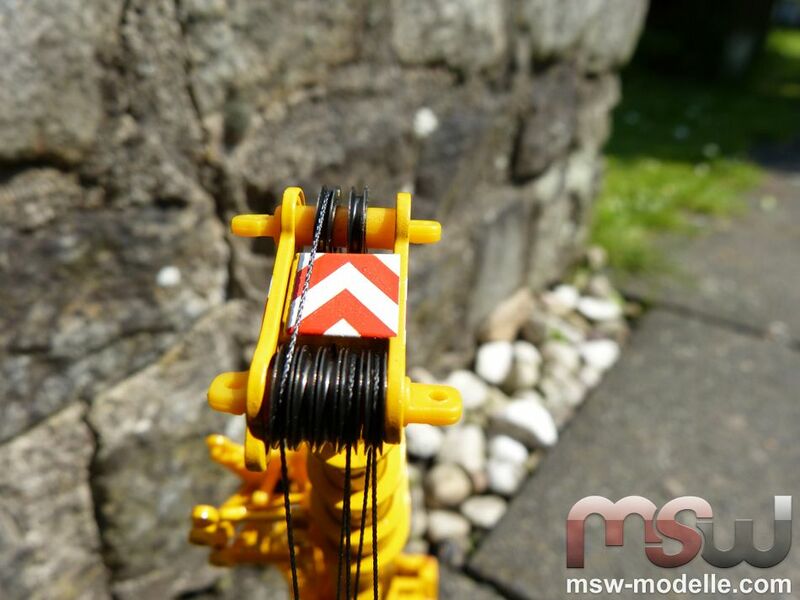 The screw thread can be seen only on the upper 4 mm on the inside of the outrigger. And even the hydraulic pipes have been indicated well. 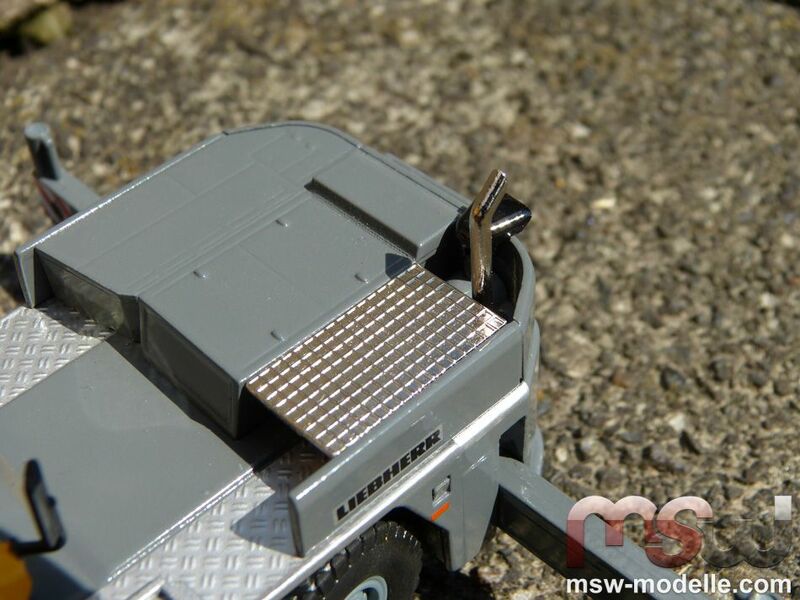 The undercarriage also features an anti-slip surface and small access ladders in order to increase safety. At the backside the exhaust pipe and cooler copy are located. 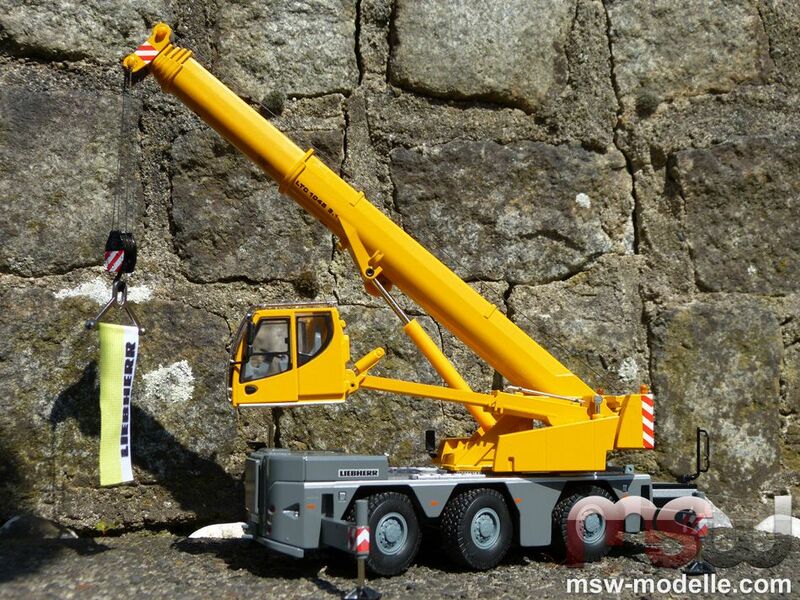 A 240 kW Mercedes diesel engine is installed on the real crane. A toolbox can be hinged to the front of the carrier; of course the anti slip surface does exist on it as well. An additional sign plate features the name „UL-LTC 1045“ – really a nice idea. An additional mirror is attached to the box. The innovative cab concept is really an eye-catcher on the superstructure. 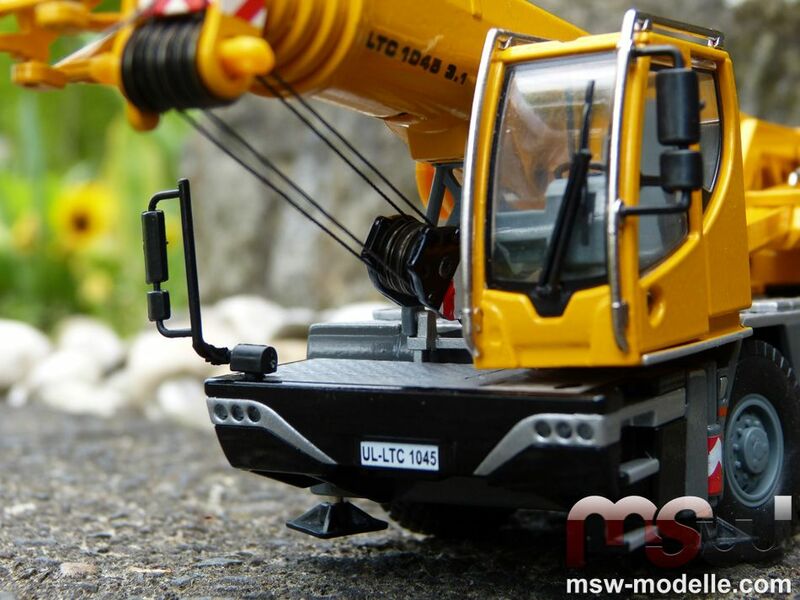 Best visibility while travelling and work is achieved due to the telescopic concept. 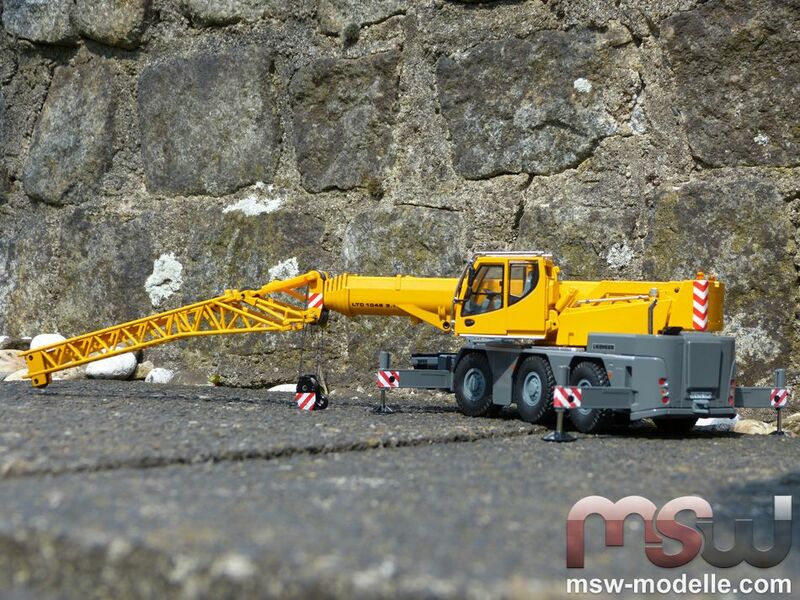 With an eye level of 15 cm or 7,8 m on the real crane the visibility to the entire working area is superior. 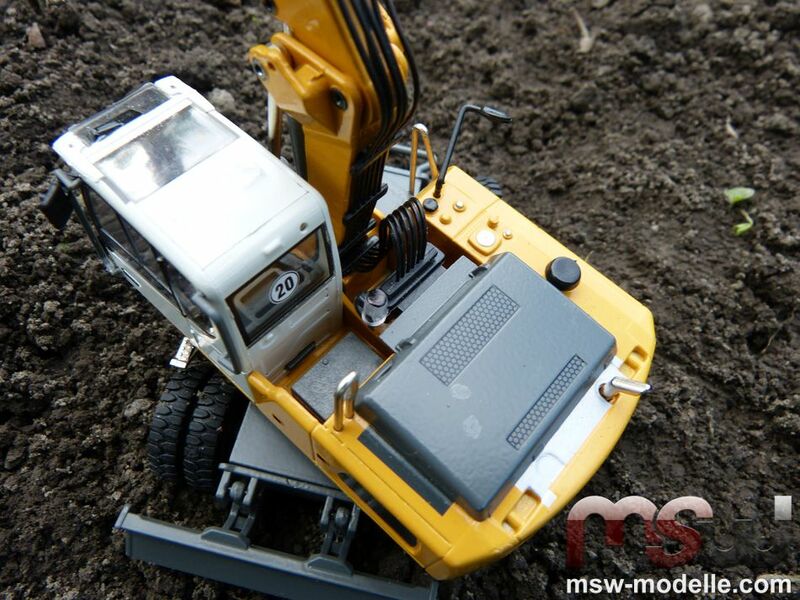 A small hydraulic cylinder adjusts the cab in every position. 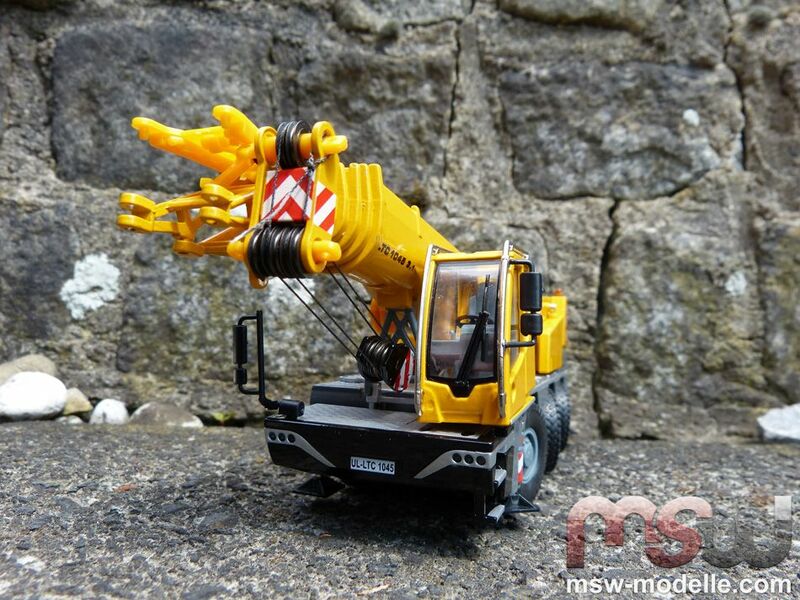 But the extending section of the cab arm is made of plastic and painted. On the review model small scratches did exist. 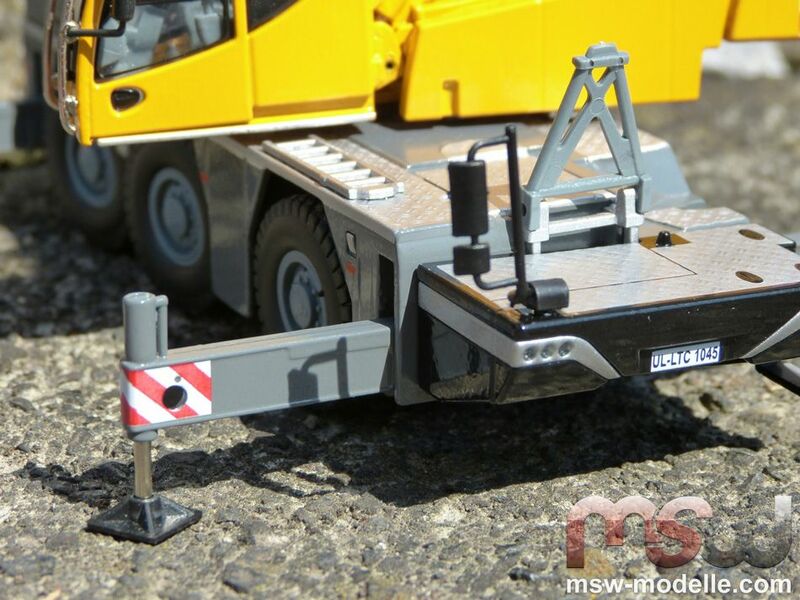 While travelling the cab is positioned right above the toolbox; therefore the visibility is also perfect. The boom is resting on the frame, which is also used for the hook. And also the cab is an example for the increased level of details. Handrails are made of zinc; a small mirror is assembled to this handrail. 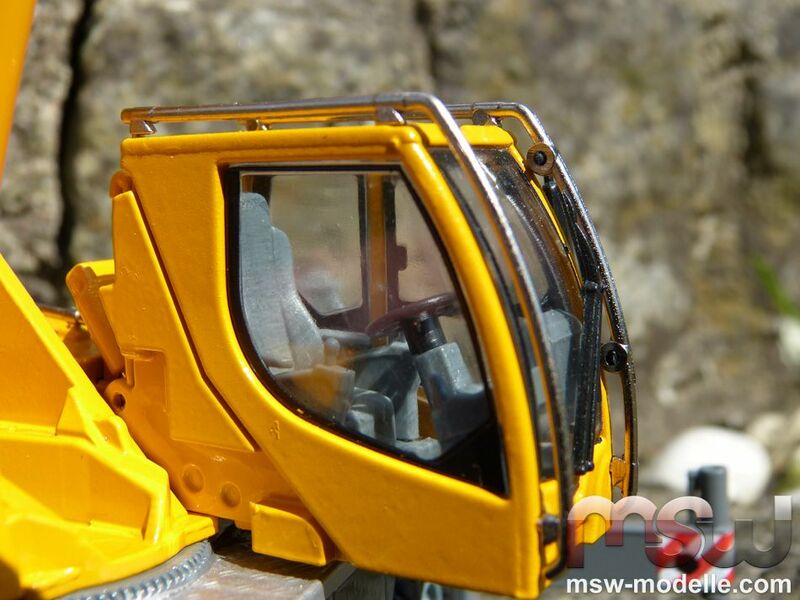 And finally a real windscreen wiper is attached to the cab; and not only indicated. 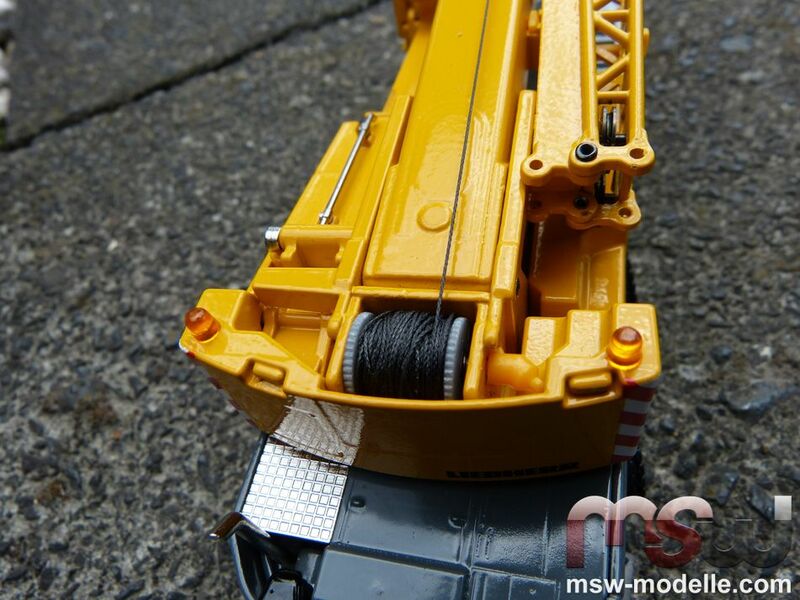 The main winch comes equipped with enough twist free line. 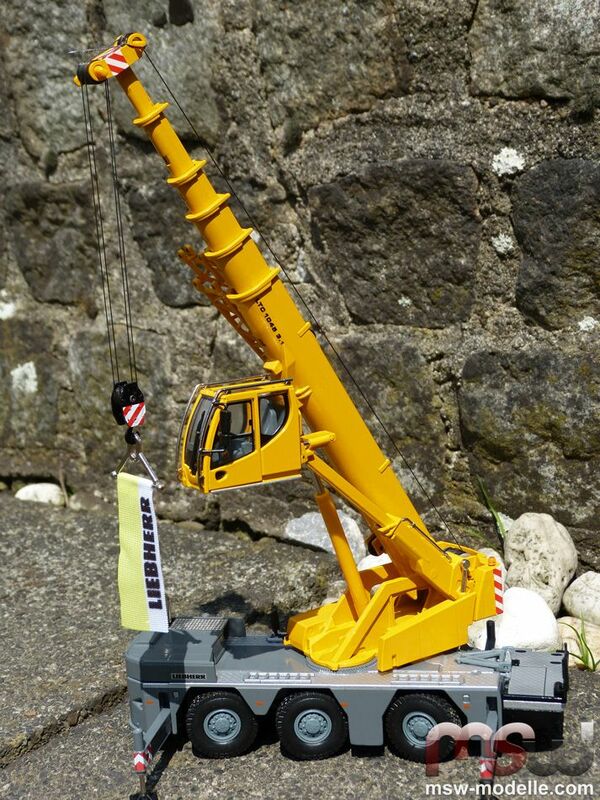 Even a 4-line reeved hook can be lowered to the ground with a fully extended boom. Completely new is the small, indicated winch motor. 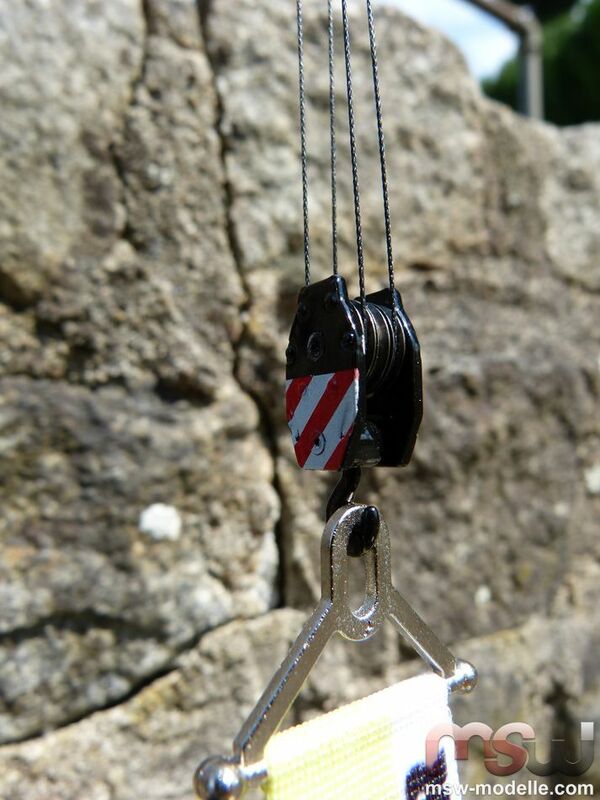 Additional beacon lights attached to the counterweight would create more safety in reality. 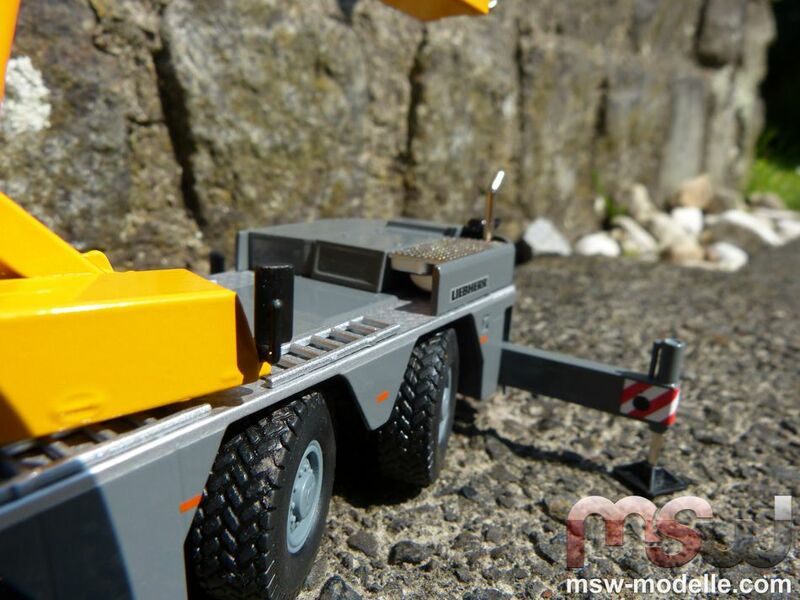 The boom features five extensions and the maximum length is 72 cm or 36 m in reality. It is only the last boom section, which looks a little too thin. All sheaves are single type ones, made of metal and rotate easily. Conrad treated the LTC 1045-3.1 model also a completely new hook block, which perfectly fits to the model due to its realistic look. 3 metal sheaves exist here – the same amount as in reality. 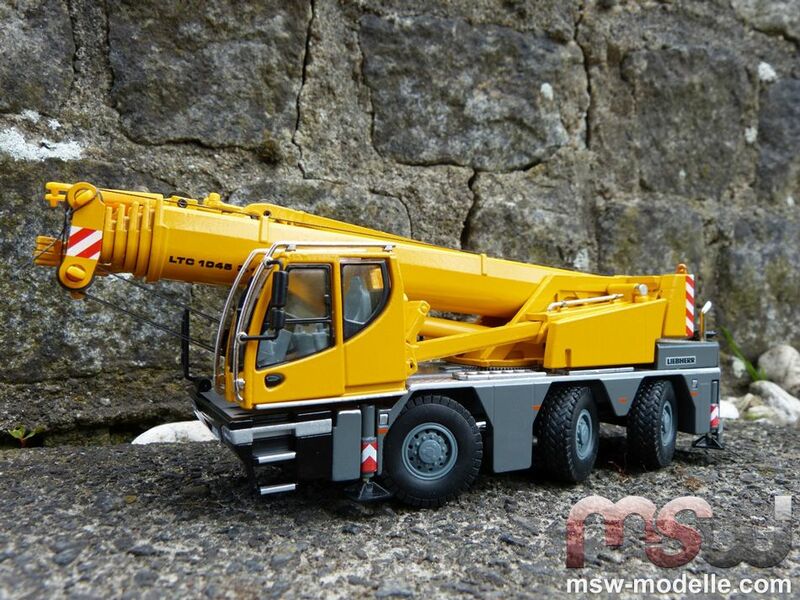 The maximum capacity of this hook would be 32,3 t.
And also the 5 sheaves in the boom head are copied correctly. The additional boom extension can be easily assembled; 4 small bolts would connect it to the boom head. Additionally it can be assembled in an authentic angle of 0°, 20°, 40° und 60°. 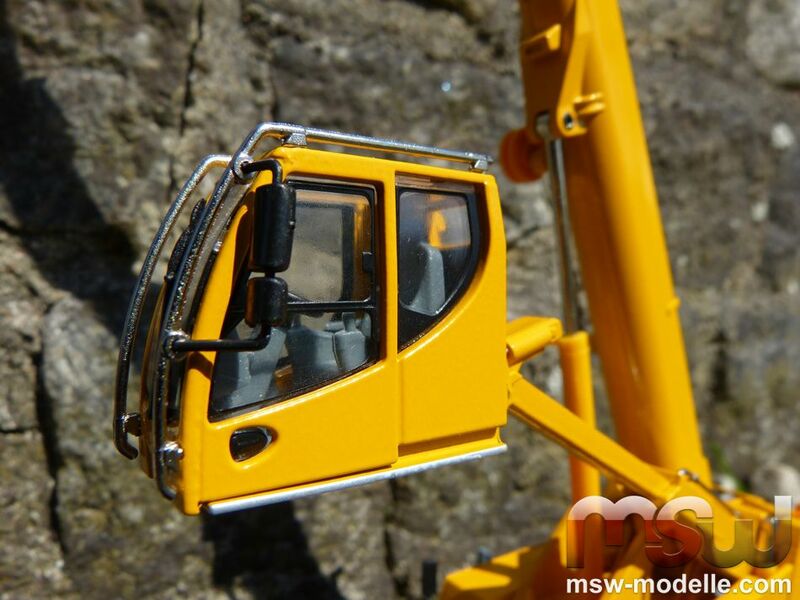 The total height of the model with extension is 102 cm or 51 m. On the real crane assembling the extension is done from the surface. Within the boom extension a small runner is included, which is used when working right underneath a roof. The three sheaves are correctly copied on the runner. While travelling the extension is attached to sideways-located frames. Conrad’s Liebherr A920 at work with backhoe bucket. 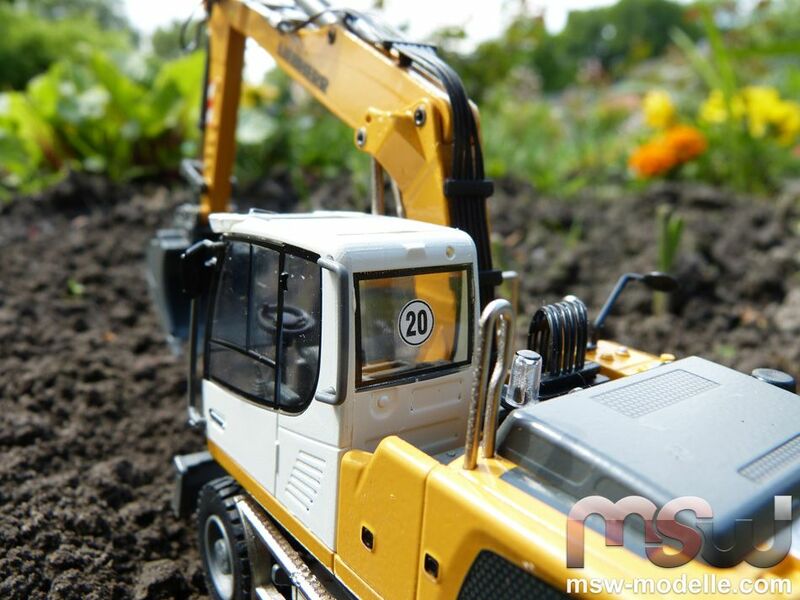 Plastic has been reduced to a minimum and the new level of details really fascinates since it was never achieved on Conrad excavator models. The undercarriage features a well copied drive train with crankshaft and travel motor. 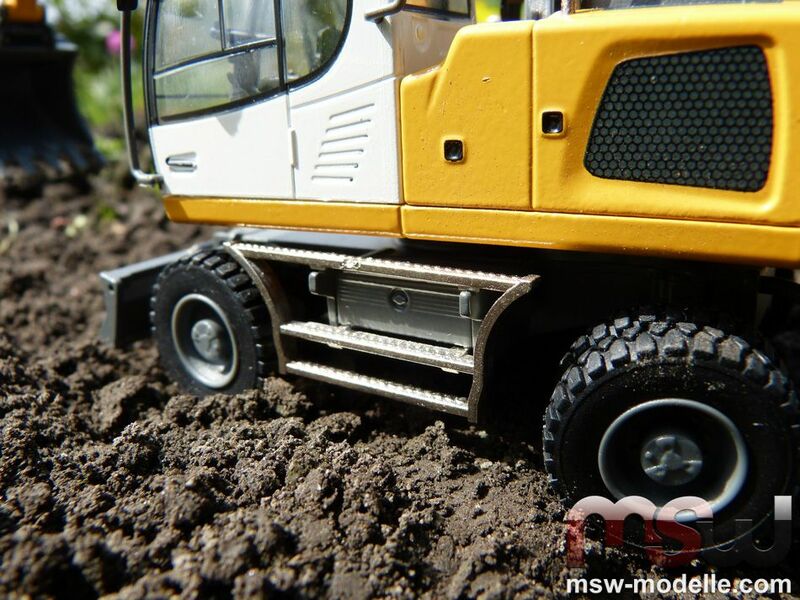 The steering axle is oscillating and features a sufficient steering angle. The side access appears in a chromatized look and covers the side and also the toolbox located behind it. The cab convinces with a fully detailed interior. 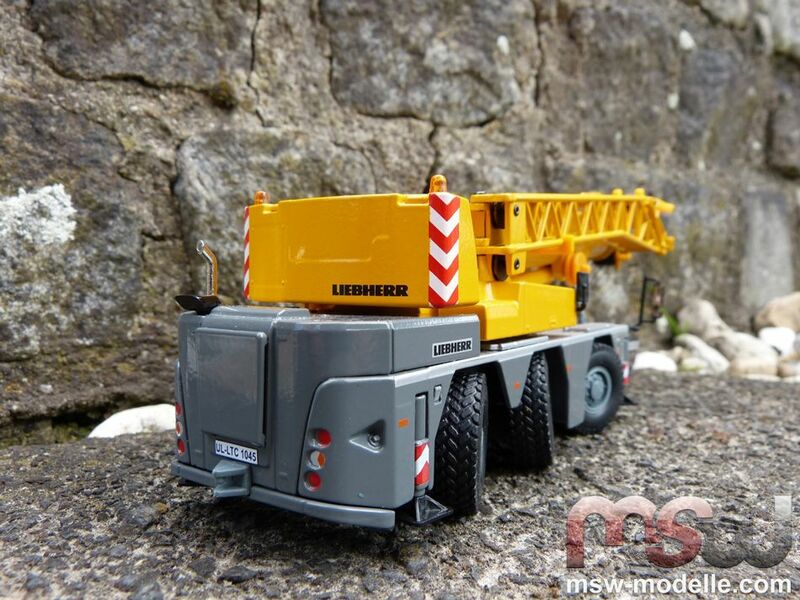 Handrails, mirrors and a handrail behind the cab complete the great level of details. Even the small maximum speed sign is printed to the cab’s back window. The superstructure from the bird’s eye view: engine hood, central lubrication system and access are not missing. A 120 kW Liebherr engine is installed on the real A920. The hydraulically adjustable boom comes with a detailed copy of the hydraulic installation. Hoses are routed to all cylinders and even the pipes in-between are copied well including the pipes on all cylinders. 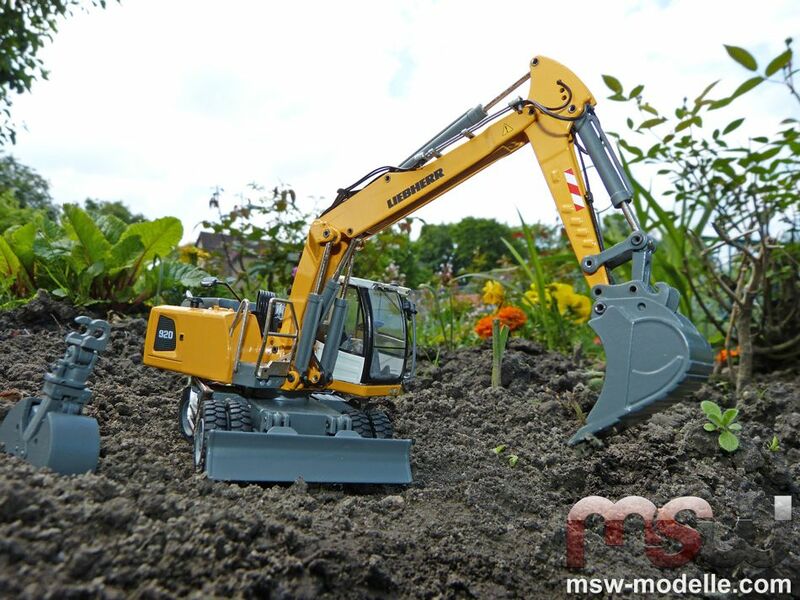 Conrad delivers the A920 with both backhoe bucket and clamshell grapple. 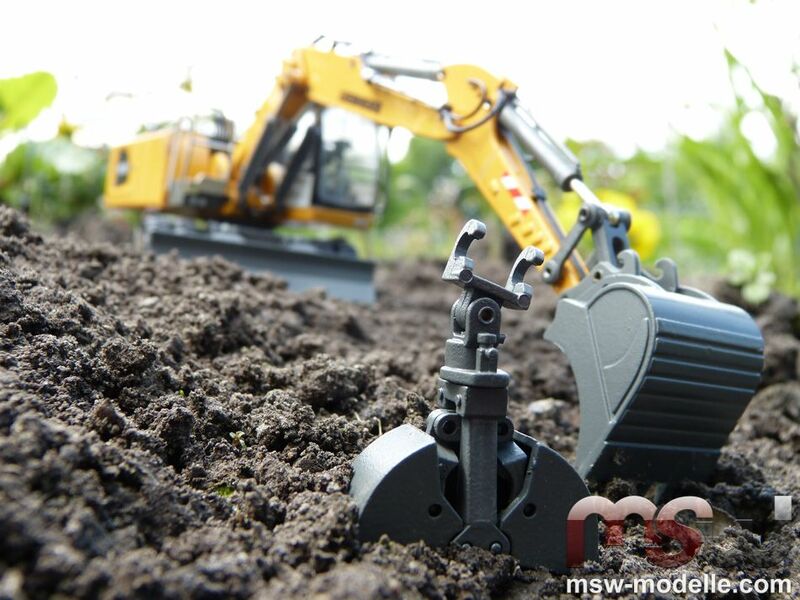 But the grapple originally appeared on an older Atlas excavator from Conrad and is not really a good fit to the model. 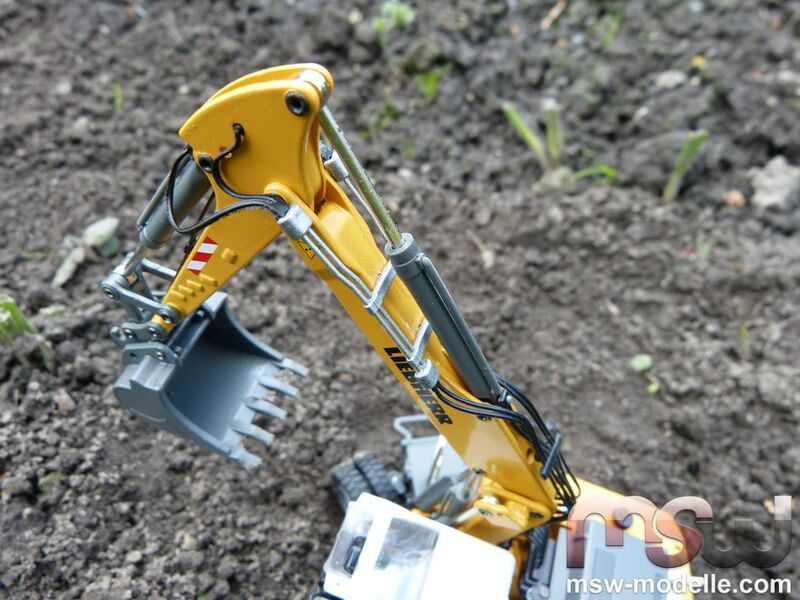 It is also not recommended to often exchange both tools since the bucket is connected not by bolts. Conrad also used black rivets for the very first time instead of the former brass rivets. And these new rivets really look perfectly authentic. Turning lights and warning signs are located on the counterweight. Small handholds for all side covers are indicated on the model as well. 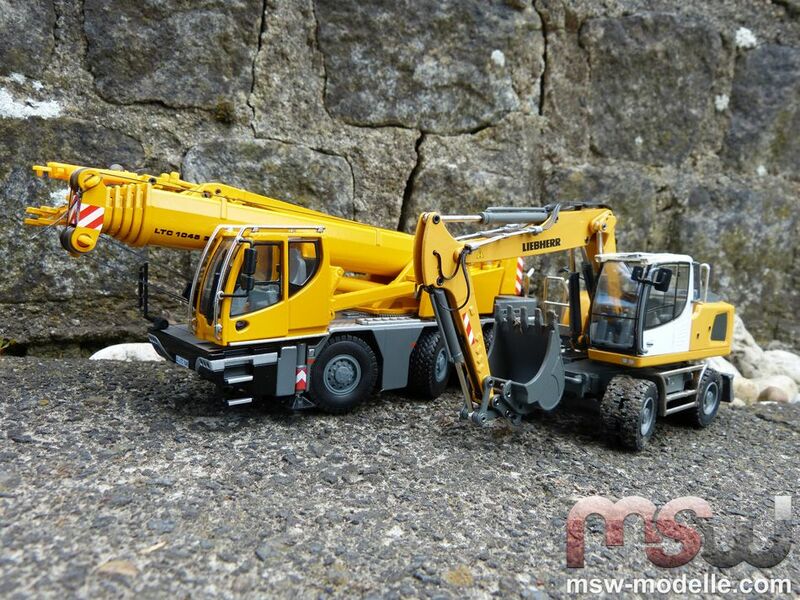 A strong duo from Conrad: Liebherr LTC1045-3.1 and Liebherr A920 with great functionality and superior details.